I am attached. To birth, beauty, wonder, awe, love and laughter, to all the precious awarenesses that electrify and fill me with aliveness. We are in a season energized with new life. We feel it when we walk in the woods, when the deep green around us permeates and feeds us to our bones. 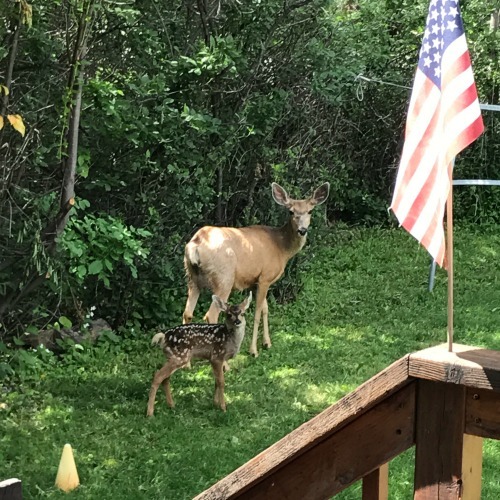 This fawn, and her mama, were in our backyard a few days ago. Deer are a common sight in Boulder. We love them, watch them, make way for them, sometimes help them, and protect them as much as we can around here. They are a symbol of the natural balance we work so hard to achieve, a gentle remedy that cures us of our own human-ness for the few short moments we watch them pass by. If we are truly conscious, we understand these little moments are the precious ones we live for. Life and death are not so far apart as we think. She was lying under our apple tree in our backyard, near the creek. I was stunned when I saw her. The thick weight of sadness grew heavy in my chest, and I could feel myself sinking deeper into the soft earth. I have no idea how she died, but her body was without injury and as beautiful as it was the day she was born. Life and death are not so far apart as we think. We tend to think in terms of years, when we need to be thinking in terms of moments–precious, fleeting, impermanent moments. Birth does not entitle any of us to a long, healthy life, it never has. After finding her, I ran inside, found my smudge wand, then sat down quietly beside her. I offered love, prayer, and gratitude to the Mother for the short time we had with her. I was reminded that despite what we might think we are owed in this life, we are entitled to nothing. Birth does not entitle any of us to a long, healthy life, it never has. What we are given are chances, chances to discover that life is fully lived in the moments we are awake and paying attention, and each one is a gift not to be taken for granted. 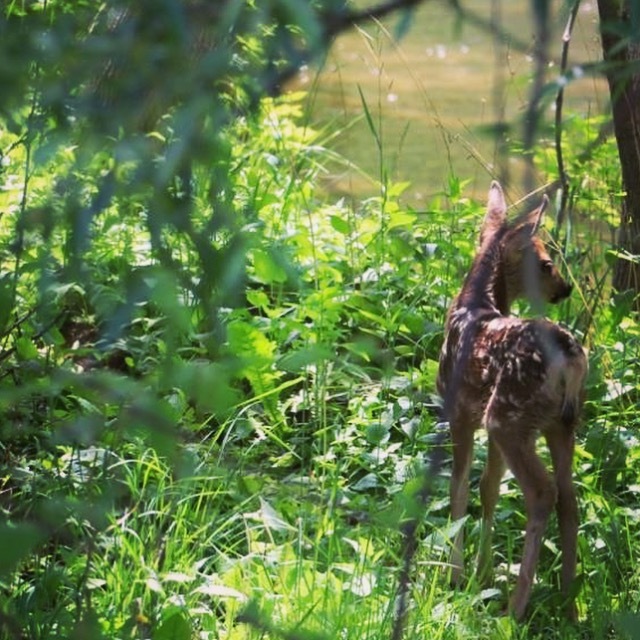 I soon learned that the fawn beneath our apple tree was not the fawn I had seen the previous day. Shortly after sitting down with this fawn, I felt the presence of something to my right. I looked over and it was the mother, the same mother I had seen the day before. She stared at me intently as I slowly backed away from her fawn and walked back up onto the deck. I then saw another movement out of the corner of my eye. Another fawn, trotted over to the mother, the same fawn I had seen the day before, and sibling to the one that had died. This mother deer had two babes. They had come back to check on the one that no longer lived. I cannot accurately describe the emotions I felt in those moments. A spiritual and emotional concoction of compassion, sadness, awe, elation, revelation, wonder, reality, gratitude, and gravity. What I witnessed was the beginning and the end all at once, life and death in full bloom. The three of us held each other’s gaze, in curiosity, intensity, and for me, complete and utter love, compassion and reverence. I could only hope that their higher developed senses could receive and feel all I was sending. Misa can’t sing or cook well, but she can dance and write. She lives to teach people to dance and embody their most authentic selves through music and movement. 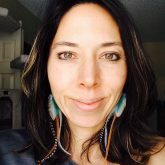 Her passion is connection in community, and cultivating reverence for death, loss, and grief, as well as gratitude, joy, and aliveness. Misa is a Pediatric Occupational Therapist, a Death Doula, and Soul Sweat™ dance instructor. She co-founded and writes at Pockitudes™, Wander Wonder Discover and Death Doula Collective. This story was originally published in June 2017. Truly death is a great teacher in itself if we learn from it deeply. “Entitlement to nothing”. So, so humbling to read that and know it is the truth. Thank you for this. Such a hard truth. A day after this story posted. I learned a friend of mine died 2 days after giving birth to her son, her miracle baby, the one she has been trying for for a very long time. I sat for an entire day in grief. It’s so hard not to bring in the word “fair” into it. I think we have gotten so used to the noise, and getting what we want, even in the smallest things, we forget there are miracles in having all that we do. Go well John, and thanks for reading. Dear Misa, how very sad to read about your friend who died 2 days after giving birth. May God be with her husband and son. Our understanding is incomplete as humans. God bless you, dear Misa. Your sharing this truly makes one realize we can take nothing for granted. So rich. Beautiful. Touching. Thank you for sharing. Much love. Thank you so much :-). Wow, I love that they came back! And you were there! Yes, she came back many times that day actually, almost like a mourning ritual. Misa, thank-you for this heart-warming, beautiful essay! 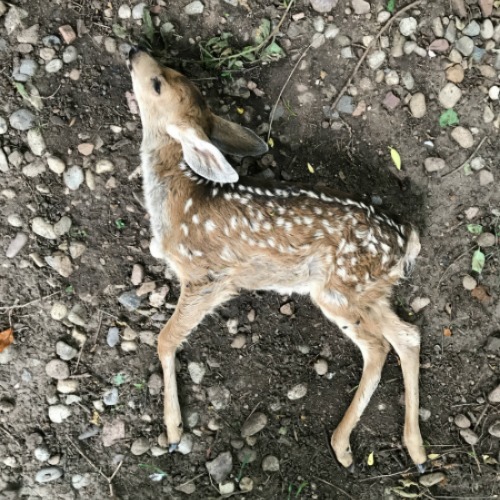 I started crying when I saw the photo of the dead fawn. Yes, we may be far closer to our last breath than we imagine. Thank-you for this reminder to embrace and appreciate life here and now and treasure each moment!!! Bless you, dear Misa. It’s a beautiful story, Misa, thank you! it is true that, just to look at the nature and we will understand all better.